Chicken can be prepared many ways, but grilling is a healthy option that requires minimal addition of fat for cooking. Throughout the day, women should include around 5 oz. of meat or meat products in their diet. Men require more calories and should consume around 6 oz, suggests MyPyramid.gov. A full-size chicken breast can weigh between 6 and 9 oz. Consuming the entire breast in one sitting takes up more than your ideal servings for the entire day. Keep your serving of grilled chicken to a modest 3 oz. portion. This way, you can include meat in other meals throughout the day. While there are many different cuts of chicken that you can grill, the breast of chicken is most popular. 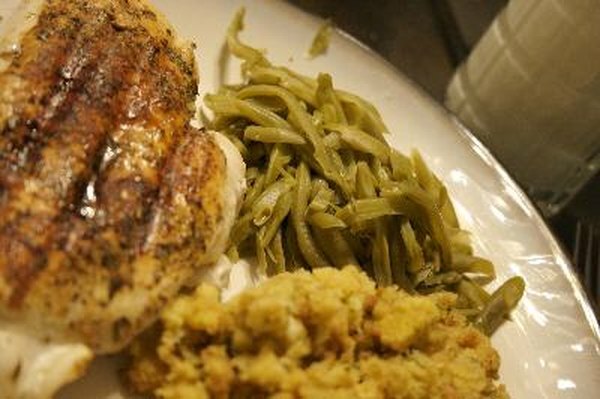 Lean, skinless chicken breast provides 135 calories per 3 oz. portion, according to the American Dietetic Association. Dark meat, such as the thigh, contains around 165 calories per 3 oz. skinless serving. Leaving the skin on packs on an additional 60 calories. Grilling requires you to add some kind of fat to the chicken so it doesn't stick. Save calories by using a zero-calorie nonstick cooking spray. You can also add some flavor by drizzling on a small amount of olive oil prior to grilling. Adding 1 tsp. of olive oil provides 45 calories. Chicken breast has the lowest total fat content compared to other cuts of chicken. A 3 oz. portion of skinless white breast has about 4 g of fat, but leaving the skin on can add as much as 6 g of additional fat. Dark meat contains nearly 9 g of fat per 3 oz. skinless serving. Some of the fat in chicken is saturated. A diet high in saturated fat can increase your risk of heart disease. This type of unhealthy fat should account for no more than 7 percent of your total calories for the day, suggests the American Heart Association. If you consume 2,000 calories per day, limit your saturated fat intake to 15 g. Chicken breast provides a little less than 1 g of saturated fat per 3 oz. serving, with darker meat having slightly higher amounts. Grilled, skinless chicken breast is a lean, healthy source of protein. Each 3 oz. serving provides 21 g of protein. Dark meat contains the same amount of protein. Leaving the skin on your grilled chicken provides an additional 8 g of protein. Chicken, as well as other animal meat, does not contain carbohydrates. Each 3 oz. serving of grilled chicken is rich in iron. This mineral is available in two forms: heme, from animal meat, and nonheme, from plant foods. Heme iron transports oxygen to cells, tissues and organs, explains the Office of Dietary Supplements. Dark meat has more iron than white meat, about 1.3 mg versus 1 mg.